Hi, this is Joel Young, I’m the creator & custodian of The NPA Process - a simple method that I, and thousands of others around the globe, have used to stop taking people and situations personally. It’s a really cool way to help yourself feel liberated and more connected to yourself in challenging situations. Physical stuff: recurring pain, weight issues & illness. Relationship stuff: breakup, relationship conflict, parent-child issues. Work & Money stuff: financial crisis or debt, not enough clients, career indecision. Are You Experiencing A Situation Like One Of These? Would You Like To Let It Go? "I keep on having headaches and nothing will make them go away." "I have had knee pain for ages now and despite going to all the different experts nothing seems to work." "I have been trying to get into a regular exercise routine for the last 10 years and I have never quite managed it and would so love to be the athlete I once was, despite my best efforts I have never been able to crack it and am slowly getting fatter." 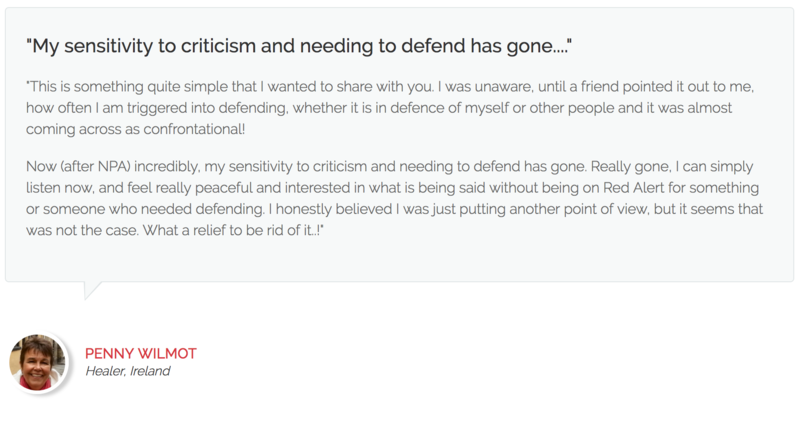 "I was terrified after a medial diagnosis and began to obsess about it in an unhealthy way." "I have had a lifelong battle with weight." "I have always felt unattractive ugly and out of place especially when I am with the 'beautiful’ people"
"I am splitting up from my husband and it is causing me huge amounts of pain and I just cant seem to get over it"
“I am paralysed by indecision"
There's a term we use for those 'key relevant and connected phrases' in NPA and we call them 'Cookie Cutters'. They can actually be a single word, a phrase, a sound, a gesture... Many things, and as I keep saying, knowing how to spot them is essential! I have dedicated over 18 years to helping people find more peace, more freedom, more love and more success in their lives. I’ve worked with literally thousands of people in over 20 countries around the world - I’ve seen every kind of block, resistance, pain and suffering and witnessed miracles, transformations and ‘gob-smacking’ progress in every walk of human experience. I’ve developed a deep understanding of the human condition. I understand how and why we block ourselves from getting where we say we want to go, and it’s easy for me to guide someone through their tricky inner territory so they can emerge bang on track for hitting their target. But I wanted to go a step further. I wanted to provide simple, practical and easy to apply ways for people to navigate themselves through that territory. This way, I knew, I could help so many more people. People like you who want to naturally and easily let go of unnecessary suffering; so you’ll finally get the relief you deserve. When my method, which I call NPA, came along I realised I had the answer to that prayer. So, the thing you really need to know is that the key to NPA, is knowing how to find the key words that apply to YOU and YOUR life situation. Additional and important instructions for using The NPA Process that will help you relax and let it be easy. The essential question to ask yourself when you’re looking for those key words, and the surprising approach to answering it. How to spot those all important key words. (As I said, I actually call the word or phrase a “Cookie Cutter” and getting this right is absolutely critical to success). The simple ‘hold-your-hand’ cheat sheet that you can action right away and start improving your situation today! …and (there are) so many more ‘secondary’ benefits. I can’t emphasise enough how important it is to know how to find the cookie cutter key words and tailor the process to fit each situation, and without guidance you’ll almost certainly fall into the traps that I see people fall into all the time. 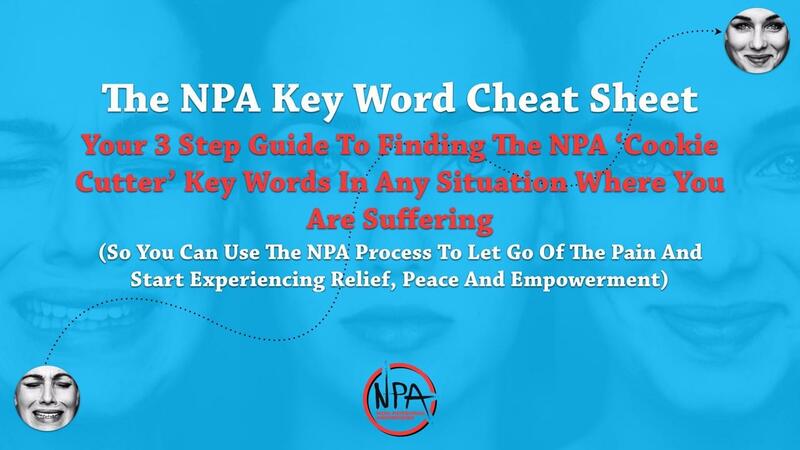 Don’t Try To Use The NPA Process In This Way Until You’ve Followed The 3 Step Guide To Finding The Key Words! I want you to experience the shifts that YOU want! That’s why I’ve taken the time to bring my focus, my experience and expertise to this topic and create The 3 Step Guide for YOU! So now you don’t have to guess and you don’t have to go it alone! Not only do you get the sheet that guides you around all the pitfalls and allows you to find the impactful cookie cutters, but you'll also get access to a bonus video that walks you through the sheet with additional pointers and insights! Finally get that sense of inner self-respect that comes from NOT taking things personally! Get ready to have your friends marvel at your transformation and demand to know what you’ve been doing! Make that all important step towards a new, lighter you today! As long as you can talk, write or express yourself in some way, the process can be applied to whatever is going on in your life. It's not about 'figuring it out', it's simpler than that and I lay it all out for you in The NPA Key Word Cheat Sheet. An essential guide to opening up the power of The NPA Process so you can use it to let go of the yucky stuff and start experiencing relief, peace and empowerment on all levels. NEW: Includes bonus video for additional support and tips!